As we continue to delve further into the LatAm genre scene one country continues to pop up in the conversation, Argentina. The country is home to the co-production market Blood Window, the genre arm of the Ventana Sur production market, which turns out a tremendous amount of support for LatAm genre cinema from all corners of this group of nations in the Americas. One Argentine director to reap the benefits of the program is Adrián Gastón Fares. The writer and director made a big impression with two horror film projects, Walichu and Mr. Time. Fares passed along two recent teaser posters for the productions which we are sharing with you today. Walichu was the Feature Film Production Award Winner at the most recent market. 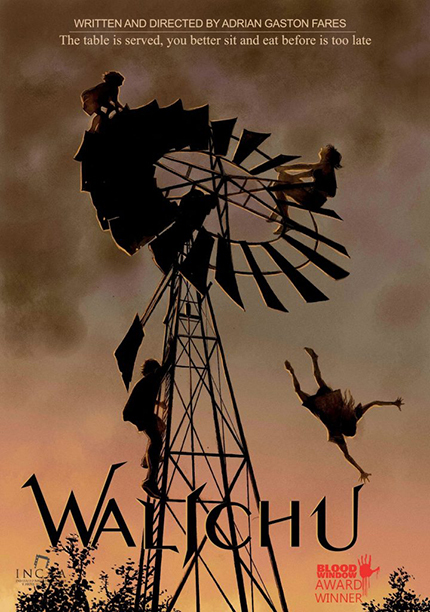 Walichu (Gualicho in Spanish) heads into production in February/March. The Gualicho (or Gualichu) was an evil spirit feared by the indigenous groups, the Mapuche and Tehuelche, in southern Argentina and Chile. Nico Onetti, writer director and producer of What the Waters Left Behind, has come on board as an executive producer. Sales agents and International producers have also shown an interest in the project so the script is currently being translated into English. Set dresser Sebastian Sabas (Amapola and There Be Dragons) has also expressed interest. This latest poster was illustrated by Sebastian Cabrol. In a country house a family discover that suddenly death does not exist. The hens do not die nor the people. One of the siblings dies and the others begins to kill each other. For them it´s a vice and a game they play hidden from their parents. Then a policeman arrives. And they must realize that everything has its limits. Edward is lost in the road. He finds a farmhouse inhabited by Maria and her three younger siblings. Together, they will show him there is no boundary between life and death, and that death can be a vicious game. Walichu is a visceral, fun-filled fantastic horror film, and also a drama about unintended consequences. The second project that Fares presented at Blood Window was Mr. Time, also the Feature Film Production Award Winner at Blood Window. Eduard and his friends will find out what is going on in their haunted school by following Ismael, a dead boy´s ghost whose body is entirely shaped by armies of moths. Ismael will guide them through the labyrinth of time this school has become. They will soon find out that there is no escape from the hand of Mr. Time. This fantasy horror movie is set in a nineties high school. 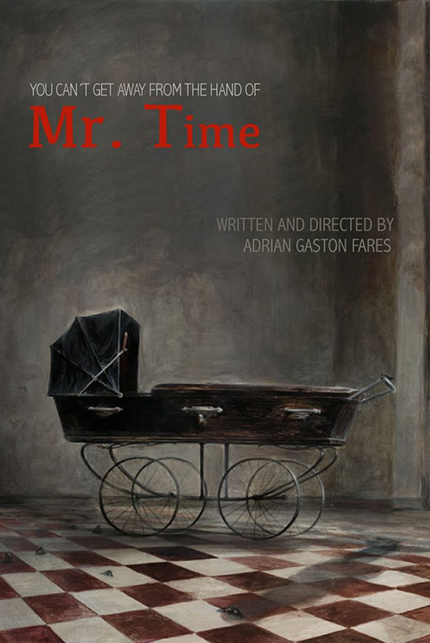 A group of teenagers friends struggles with an entity known as Mr. Time. This monstrous appearance entity can control time at his own will. But, beware, in the meantime you can lost a finger, because in this story the hands of time are for real. This second film appears to be only at the script stage so there is no firm word on when/if production begins. The teaser poster was illustrated by a well known Argentine artist Santiago Caruso.